Selecting flooring can be a challenge. There are so many options to choose from, the possibilities are endless. You can choose everything from the color and finish to the type and species to create the perfect floor. Our guides can help you narrow down the options and determine what type of flooring will work best for you. Choosing the right color for your wood floor is a big decision. Determine which shade and color suits your space best. The width of flooring planks is not just about the width of your floor, but the overall dimensions of your entire floor. Find the perfect width for your space. Not all floorboards are built the same. Discover the differences between solid hardwood and engineered wood floors. Color variations, wild grain patterns, and knots can add unique character to your floor. Wood flooring grades influence your flooring’s overall style. Explore everything you should consider when choosing between prefinished or unfinished wood flooring. Considering radiant heat underneath your wood floors? Know what to look out for with our free guide. 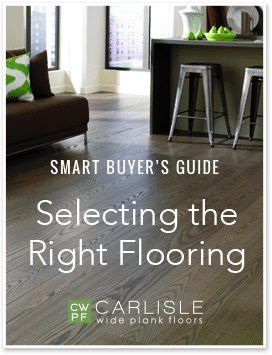 Download our wood flooring buyer’s guide for helpful advice on how to choose and shop for wood flooring. Learn why wood is the superior flooring choice while exploring wood species, style, colors and textures. Understand durability, performance, installation options and more.